Rara Readable is a clean and minimalist free WordPress blog theme. The theme is designed for distraction-free reading and focuses on better user engagement and experience. The theme is easy on eye and a pleasure to read with its clutter-free design focused on the content with neat fonts and subtle color scheme. The theme is very lightweight and loads quickly improving the overall user experience. The theme has a responsive design and SEO-friendly optimized codes. Rara Readable is Schema friendly and AMP compatible so that your website ranks better on search engines. It is also WooCommerce compatible and translation ready. Rara Readable is a Medium style free WordPress blog theme for writers for distraction-free reading. It’s designed in a clean and minimal way that’s easy-on-the-eye so that you can create your own journal or personal blogs! It is fully responsive and displays elegantly on all kinds of devices. By putting an emphasis on the content, Rara Readable offers your visitors high readability and easy navigation across your blog - not to mention faster loading and a pleasurable user experience. You will definitely fall in love with its stunning, minimal design and the use of crisp fonts as well as a subtle color scheme. If you want a free theme that’s optimized for displaying beautiful and distraction-free content, the free version of Rara Readable is for you! Get a clean, minimal and professional-looking blog without having to write codes - and for FREE. Enjoy a mobile-friendly design that’s fully responsive and displays gracefully on all the devices. Monetize your blog with WooCommerce plugin support that allows you to sell products or conduct easy ecommerce with your visitors. Enjoy the world-class support, quickly and promptly from a team of dedicated developers and designers. Say goodbye to language barriers as the theme supports RTL and is translation-ready. You want to create a clean, elegant, and fully responsive WordPress blog for FREE! You do not want to spend your valuable time writing codes to create your blog. You want a eye-catching blog that optimizes your content for easy reading. You want to impress your visitors with your blog’s professional design and want to win their trust. You want to create your own journal, personal blog,or other content-oriented blog. You want a professional and stunning website but spending money on a developer is not your current priority. If you are in a position of sharing your day-to-day experience with a unique and value-added point-of-view, you should consider putting out your unique opinions out in the world through the SEO-friendly and speed-optimized Rara Readable Free WordPress blog theme. Personal blogs are one of the most interesting stuff to read on the internet as they offer unique insight and life experiences. If you think sharing your life experiences can add value to the others, Rara Readable is optimized to put your content out in a manner that keeps people interested in reading. Travel a lot? The clean and contemporary design of Rara Readable is just perfect for documenting your travel stories. The minimal design and modern look and feel of Rara Readable is perfect for putting out stunning lifestyle imageries before your audience. Write about your opinions and your feedback on a myriad of topics and put it out before the world. This content-driven theme will give your reviews the best possible engagement! Sharing your knowledge and expertise had never been easier. The clean template of Rara Readable loads faster giving your value-seeking-learners a fantastic experience on your site. Rara Readable has removed all the sidebars and other distractions that might pull the focus away from your content. Whether it is your home page or a single post page, the use of crisp typeface, right font size, spacing as well as the optimum use of white space makes this theme easy-on-the-eye and perfect for a distraction-free reading. Rara Readable adapts well and displays elegantly on devices of all screen sizes. With more than 50% of Google searches being done on mobile phones, this fully-responsive theme optimized for smart phones and passes Google mobile-friendly test. This means better rankings in search results and better user experience. Here’s one more feature that adds to your search engine ranking. You can show your last updated date on the single post page, which impresses Google as it prefers to rank recently updated posts. Your visitors can enjoy the experience of browsing smoothly on your blog. That way, you won’t risk losing your long-term readers, potential customers, or new leads. 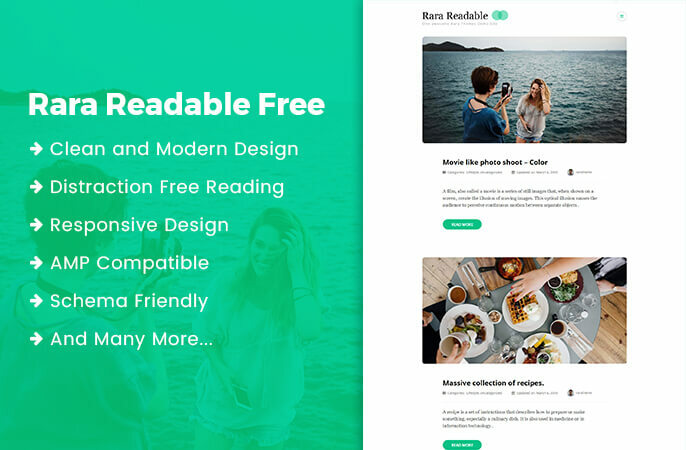 Rara Readable free WordPress theme is compatible with WooCommerce, which enables you and your visitors to enter in an ecommerce transaction with ease and comfort. You can earn good money by promoting your own product or an affiliate product. And you can sell products online through your blog. Always leave a beautiful impression among your visitors. Now you can easily select a fallback banner image for your single post or page, which will automatically show in case you have not selected any image for that particular post or page. Use your social media to boost your business with easy integration supported by Rara Readable. Display your social links on your blog and grow your social presence! The theme also supports Russian and Chinese social media like OK, VK, qq, Zing, and others. The theme allows you to introduce the person behind the content. You can always add profile picture, name, and description of the author so that your visitors and readers know who is feeding them information. Show the most related posts in the same category to the one that your visitor is currently reading. This increases the engagement on your page and helps you in internal link building. You can improve your on-page SEO and get better Google rankings. You can include only the excerpt of your post so that the readers can decide if they want to read the full post or not. You can choose between 5 to 200 words for the length of the excerpt. If you choose your words correctly, you can easily generate curiosity and encourage your readers to read on. You will always have our easy-to-use guide on how to set up and run your blog.Get the detailed documentation and get your blog set up in no time! Any confusions? Questions? Or maybe just some feedback or ideas to throw our way. You can always reach out to our friendly and eager support team and get quick assistance regarding the theme. The theme is optimized for widgets so you can go ahead, customize, and add widgets as per your requirement without worrying about compromising design or layout. The theme works smoothly and perfectly on all the latest version of all the major web browsers including Chrome, Firefox, Safari, Internet Explorer, and Edge. Help your visitors easily navigate across your blog and get a maximum engagement on your page with Rara Readable breadcrumb option. The eye-catching and crisp font used by the theme is are ensured to be of legible size, spaces, and contrast, so that your readers can enjoy visiting your blog and reading your content. Never worry about reaching an audience who speaks a different language. Rara Readable theme supports localization as it can be easily translated in the local language. Do you follow a different script style? You can write your content the way you want! Rara Readable WordPress blog theme supports right-to-left (RTL) scripts like Arabic besides the regular LTR languages. Get regular updates from us that will keep your blog secured and up-to-date with the latest security as well as technical standards. Have your own unique identity and brand! Rara Readable allows you to easily add a custom logo for your site. Modify CSS effects or change color of a section easily. With Rara Readable theme, you can add CSS effects right from the customizer. The theme’s clean, well-organized, and commented code allows your to easily customize and edit your website.